Amidst the large and sometimes confusing variety of hormone replacement therapy options, “natural” hormones have been growing in both visibility and popularity. Creams containing wild yam extracts or natural progesterone, or oral natural progesterone preparations are emerging as the HRT option of choice for some women. What are these products, and what is known about their safety and efficacy? Progestins (or progestagens) are a class of compounds that includes progesterone, a hormone produced by the ovaries. “Natural” progesterone is derived from soybeans or, most commonly, from an inedible wild Mexican yam (Diascorea uillosa). Synthetic forms of progestins are widely available and are used in birth control pills and hormone replacement therapy regimens. Progesterone used to be available only in injectable forms, but in the last few years, oral progesterone capsules have become available. Progesterone is believed by many to have fewer side effects than synthetic progestins (which sometimes cause breast tenderness, bloating, and irritability). Natural progesterone was included in the PEPI study, which found that it was equally effective in protecting the endornetrium (uterine lining) and less likely to interfere with estrogen’s improvement of HDL cholesterol levels (the good kind) than a synthetic progestogen (PEPI writing group 1995). However, natural progesterone is also being promoted as safe and effective hormone therapy by itself. It is sold over the- counter as a moisturizing cream, and in capsules to be placed under the tongue. Natural progesterone cream has been touted as a prophylactic against hot flashes, osteoporosis, and even breast cancer. Almost all claims can be traced to a popular booklet written by John M. Lee M.D. Lee claims that the unifying factor linking fibroids, breast cancer, fibrocystic breasts, PMS, and osteoporosis is “estrogen dominance secondary to a relative insufficiency of progesterone” (Lee 1993). Lee also claims that natural progesterone has none of the side effects that synthetic progestins do. Let’s examine the evidence about claimed benefits. Lee conducted a study that shows a positive effect of progesterone on bone. This one study has been published in several different publications, and all ot these multiple publications lack details about how the study was done (Lee 1990a, Lee 1990b, Lee 1991). This study is not really an experimental trial but is an unselected case series of 100 postmenopausal patients, ages 38-83. It appears that Lee simply tracked his own patients over time. There is no control group and no apparent entry criteria, beyond being postmenopausal. There is not even evidence presented that the women enrolled actually suffered from osteoporosis, beyond the very general statement that “the majority had already experienced height loss, some as much as five inches” (Lee 1990b). Lumbar bone mineral density measurements (by dual photon absorptiometry) were done on 63 of the 100 patients, and it is claimed that, over an average of 3 years, bone density increased 15.4%. This is a extraordinarily large increase, unequaled by any known drug therapy. Additionally, the bone density screening test used by Lee is not the most reliable test. Besides treatment with progesterone cream, an unspecified number of ‘women in this case series were also taking estrogen. (This fact is often not mentioned in the published reports.) Estrogen can increase bone density (although not to the degree claimed in Lee’s study). Another factor that confounds this report is that women were advised to stop smoking, to exercise for 30 minutes three times weekly. and to take a supplement regimen including calcium, vitamin D, beta carotene, and vitamin C. Smoking decreases bone mass, and exercise, calcium, and vitamin D all help build bone, so all of these factors are potential confounders. In Lee’s study, three fractures occurred; one knee fracture occurred in an 80-year-old in a car accident, another subject in her 70s fell while hiking, and the third fell down a flight of stairs. Although it is stated that bone benefits “were unaffected by supplemental estrogen” (Lee 1990a) that statement is impossible to evaluate because one doesn’t even know how many patients were taking estrogen, let alone whether or not the subjects on estrogen had better bone. One patient in the case series developed endometrial cancer. Details, naturally, aren’t given. It is clear there are progesterone receptors on bone, and that in vitro, progesterone stimulates bone production (Verhaar, Panay), but in humans, studies are not so clear. Do progestins increase bone or decrease it? It depends. Jerilynn Prior is a researcher whose studies have been used to support the use of progesterone to maintain or increase bone. Her study of 66 premenopausal women found that short luteal phases (shorter times between menstrual periods) correlated with decreases in spinal bone density (Prior 1990b); those with the shortest luteal phases lost 2A% of bone a year. Another study of amenorrheic athletes found that those given 10 mg of medroxyprogesterone acetate (Provera) for 10 days a month had significant increases in trabecular bone (the spongier bone which makes up a high percentage of the vertebrae; leg bones have more of the harder cortical bone) (Prior 1994). Breast-feeding reduces bone density temporarily, and progestin-only contraception such as Depo-Provera (DMPA) seems to reduce postpartum bone loss (Caird). However, studies of long-term progestin use shows a decrease in bone. Users of DMPA (which usually produces amenorrhea in long term users) experience decreases in spinal bone that does not return to pretreatment levels (Cundy 1991). There is some evidence that suggests that estrogen and progesterone may have synergistic effects on bone and that progestin alone may have a mild bone-preserving effect in patients treated with GnRH agonists (Panay, Prior 1990a ). A very small percentage (2.3%) of orally administered progestin is converted into ethinyl estradiol (Reed, from Panay). More work needs to be done in this area. Estrogen is known to make fibroids grow, and claims are made by John Lee and others that progesterone will make fibroids shrink. However, there is evidence that progestogens actually have a role in fibroid growth. In one study 15 out of 16 patients treated with the synthetic progestin norethynodrel experienced an increase in fibroids; MPA inhibits the ability of GnRH agonists to shrink myomas (fibroids); and the antiprogestogenic drug RIM86 causes uterine fibroids to regress (Rein). It has been thought that progestins might adversely affect lipid profiles in women using combined rather than estrogen-only hormone replacement regimens, but the PEPI study found that adding progestins to estrogen did not significantly affect lipid parameters. Micronized natural progesterone appeared to result in the most favorable lipid profile of any progestin-containing regimen. Do lipids vary through the menstrual cycle? It’s unclear; different results have been found by different researchers. One study shows a transient drop in total cholesterol (TC) at ovulation, while others have found that TC falls after ovulation or does not change. LDL-cholesterol (LDL-C) has been reported to fall after ovulation or to remain unchanged; most studies have found HDL-cholesterol (HDL-C) to be relatively stable throughout the cycle. These studies are hampered by hormone levels not having been taken and by too few samplings. A careful study of 12 women sampled every other day (Wall), found that in the 11 women with normal cholesterol levels. HDL-C peaked at ovulation, remained elevated to mid-luteal phase, and then fell before menses. TC and LDL-C rose between menses and the preovulatory phase and fell during the ovulatory phase. There was no association between peak progesterone concentrations in the midluteal phase and TC, LDL-C, or HDL-C. In the patient with high TC, the increase in TC at ovulation was greater (48% higher than menses, compared to 12% for the others). In other words, increased HDL correlated with increased estrogen, not progesterone. Decreased LDL levels, however, may be associated with progesterone. While progestins clearly protect the endometrium from estrogen-induced endometrial cancer, they do not protect the breast (King). When Depo Provera was being considered for approval as a contraceptive in this country, there was worry about its breast-cancer promoting effect in beagles. It turns out beagles are so susceptible to breast cancer that they are not a good model, and epidemiological studies have not borne out an increased risk of breast cancer among women using progestin-containing contraceptives (Staffa). HRT appears to increase breast cancer risk, and progestins do not appear to decrease this risk (Colditz). The progestin component of HRT has variously been reported to increase, decrease, or not affect breast cancer risk(Nason). Natural progesterone is derived from either soybeans or Diascorea oillosa, the inedible Mexican wild yam. (The sweet potatoes and yams that we eat cannot be used for this purpose.) Diosgenin is the chemical compound extracted from the plants from which progesterone is derived, but there’s a lengthy process in a chemistry lab involved in the conversion. There are now dozens of topical and vaginal “wild yam” creams. Oral wild yam preparations have been used in herbal medicine, primarily to treat gastrointestinal cramping. It is unclear whether any active components of wild yam are absorbed through the skin. In any case, eating or applying wild yam extract ordiosgenin will not result in increased progesterone levels in the body because the body cannot convert diosgenin into progesterone. Products that say that they contain natural progesterone or progesterone derived from wild yams actually contain the pharmaceutical drug progesterone. Although its origin was a plant, it’s as much of a stretch to consider this an herbal product as it is to consider the birth control pill an herbal product. In fact, the birth control pill, which contains both estrogen and progestin, owes its genesis to the same plant. Progesterone was extremely expensive to derive before the process for deriving it from Diascorea was invented. If a product claims to contain only wild yam extract or diosgenin yet says it causes progestin-like effects, then it is mislabeled and actually contains the drug form of progesterone. Natural progesterone appears to have benefits over synthetic progestins in HRT regimens. Progestins can cause depression, bloating, and other symptoms in women; proponents of natural progesterone claim that only synthetic forms cause these symptoms while the natural form alleviates them. There is no evidence that supports this, but more research needs to be done to determine whether natural progesterone has markedly different beneficial or deleterious effects compared to synthetic progestins. Women who are considering using sublingual or topical progesterone to cope with menopausal changes should remember that although progesterone precursors are naturally produced by the plants from which they are extracted, natural progesterone used this way has not been shown to be risk-free in long term use. Claims that a particular hormone will extend life, reverse aging, or prevent disease without causing any adverse effects should be treated with great skepticism. 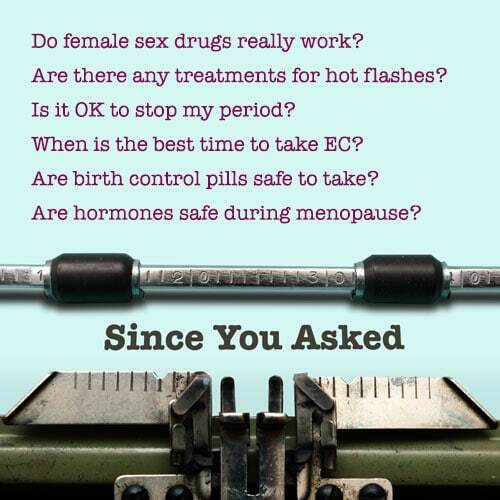 If there’s one thing we should have learned from the estrogen craze of the 1960s, it is that hormones are not panaceas, but powerful drugs that should be treated with respect. References are available from the office. This piece is from the updated version of the Network publication, ‘Taking Hormones and Women’s Health: Choices, Risks, and Benefits’. Currently under revision, it will be published later this year. Adrians Fugh-Berrnan is the Network’s Board Chair, author of Alternative Medicine: What Works, and editor of the new newsletter Alternative Therapies in Women’s Health.